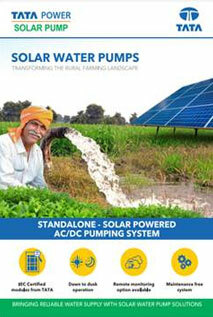 How do solar water pumps help rural regions? People from rural regions have to work additionally hard for water, especially due to the unpredictable nature of rain in the country. Our solar powered water pumps are a low cost solution enabling residents in these areas to spend more time increasing their income by growing crops etc., rather than ferrying water from far off distances. 50% of the systems cost. Submersible pumps range from Tata Power Solar supports varied applications like field irrigation or supplying potable water for your communities, while drawing water from underground water sources like bore-wells or sumps. 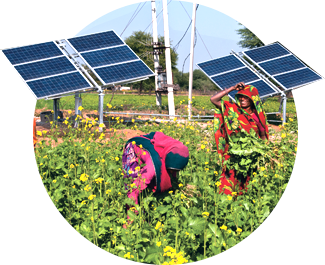 Surface pumps range from Tata Power Solar supports varied applications like field irrigation or supplying potable water to your communities, while drawing water from nearby water sources like lakes, ponds, canals or rivers.